Objective To evaluate mid-term outcomes and predictors of survival in non-operated patients with pancreatic intraductal papillary mucinous neoplasms (IPMNs) with worrisome features or high-risk stigmata as defined by International Consensus Guidelines for IPMN. Reasons for non-surgical options were physicians’ recommendation, patient personal choice or comorbidities precluding surgery. Methods In this retrospective, multicentre analysis, IPMNs were classified as branch duct (BD) and main duct (MD), the latter including mixed IPMNs. Univariate and multivariate analysis for overall survival (OS) and disease-specific survival (DSS) were obtained. Results Of 281 patients identified, 159 (57%) had BD-IPMNs and 122 (43%) had MD-IPMNs; 50 (18%) had high-risk stigmata and 231 (82%) had worrisome features. Median follow-up was 51 months. The 5-year OS and DSS for the entire cohort were 81% and 89.9%. An invasive pancreatic malignancy developed in 34 patients (12%); 31 had invasive IPMNs (11%) and 3 had IPMN-distinct pancreatic ductal adenocarcinoma (1%). Independent predictors of poor DSS in the entire cohort were age >70 years, atypical/malignant cyst fluid cytology, jaundice and MD >15 mm. Compared with MD-IPMNs, BD-IPMNs had significantly better 5-year OS (86% vs 74.1%, p=0.002) and DSS (97% vs 81.2%, p<0.0001). Patients with worrisome features had better 5-year DSS compared with those with high-risk stigmata (96.2% vs 60.2%, p<0.0001). Conclusions In elderly patients with IPMNs that have worrisome features, the 5-year DSS is 96%, suggesting that conservative management is appropriate. By contrast, presence of high-risk stigmata is associated with a 40% risk of IPMN-related death, reinforcing that surgical resection should be offered to fit patients. Main duct/mixed intraductal papillary mucinous neoplasms (IPMNs) are associated with high rate of malignancy and require surgical resection, whereas branch duct-IPMNs have a much lower rate of cancer. International guidelines introduced two categories of risk factors for malignancy: ‘worrisome features’ and ‘high-risk stigmata’. The presence of high-risk stigmata warrants surgical resection, while IPMNs with worrisome features should be further evaluated by endoscopic ultrasound and followed closely. Limited data are available for patients with worrisome feature and high-risk stigmata undergoing non-operative management. Eighty per cent of patients with worrisome features or high-risk stigmata are alive 5 years after initial diagnosis. The risk of IPMN-related death was 10-fold greater for patients with high-risk stigmata compared with those with worrisome features. The clinical course of patients with worrisome features seems particularly indolent, and non-operative management may be appropriate. In elderly patients with IPMNs that have worrisome features, conservative management is appropriate. By contrast, surgical resection should be always offered to fit patients with high-risk stigmata. Although our knowledge of intraductal papillary mucinous neoplasms (IPMNs) of the pancreas has significantly evolved, their natural history still remains largely unknown. Some 30 years ago, IPMNs were recognised as a specific entity distinct from pancreatic ductal adenocarcinoma (PDAC) and from mucinous cystic neoplams.1–3 Then, it became evident that IPMNs that involve the main pancreatic duct (MPD), its secondary branches or both, are associated with different risks of malignant transformation.4 ,5 Main duct (MD) and mixed IPMNs have a risk of malignancy of 40–90%, even in the absence of symptoms,5–7 whereas branch duct (BD)-IPMNs have a much lower rate of cancer, and for small, incidentally discovered BD-IPMNs without solid components, this risk is minimal.8–10 These observations were eventually incorporated in the first International Consensus Guidelines for IPMN (ICGI-I), which recommended surgery for all surgically fit patients with MD/combined-IPMNs, and only for those with BD-IPMN that had solid nodules, size >3 cm, positive cytology and/or symptoms (‘Sendai-positive criteria’).11 The 2012 updated version of these guidelines (ICGI-II) introduced two categories of risk factors for malignancy, namely ‘worrisome features’ and ‘high-risk stigmata’, emphasising that the presence of high-risk stigmata warrants surgical resection, while those with worrisome features should be further evaluated by endoscopic ultrasound (EUS) and followed very closely.6 These international guidelines suggest limiting surgery to ‘good surgical candidates’ and to take into account life expectancy in order to plan the most appropriate management. There is very little information regarding the mid-term outcomes of patients with worrisome features or high-risk stigmata undergoing surveillance.12–15 This subgroup of patients is of particular interest since they can give insight on the natural history of IPMN and on the real risk of tumour-progression and IPMN-related mortality. The aim of this study is to evaluate overall-specific and disease-specific survival of patients with MD, BD and mixed IPMNs with worrisome features or high-risk stigmata who did not undergo immediate surgery for physicians’ recommendation, personal choice or comorbidities. Risk factors for survival are also analysed. This multicentre, retrospective study includes consecutive patients with an IPMN with worrisome features or high-risk stigmata undergoing non-operative management from six institutions (Division of Pancreatic Surgery, Università Politecnica delle Marche, Ancona, Italy; Department of Surgery, Massachusetts General Hospital, Harvard Medical School, Boston, USA; Unit of General and Pancreatic Surgery, the Pancreas Institute, University of Verona Hospital Trust, Verona, Italy; Service de Gastroenterologie-Pancreatologie, Hopital Beaujon, Clichy, France; Division of Gastroenterology, Mayo Clinic, Rochester, USA; Center for Pancreatic Disease, Brigham and Woman's Hospital, Harvard Medical School, Boston, USA). Patients who did not undergo surgery because of locally advanced or metastatic tumours were not included in this study. Worrisome features and high-risk stigmata were defined according to ICG-II criteria.6 The category of ‘worrisome features’ included size >3 cm, MPD size of 5–9 mm, minor symptoms, pancreatitis, non-enhancing nodules and/or atypical cells at cytology. ‘High-risk stigmata’ were defined by the presence of jaundice, MPD ≥10 mm, enhancing nodules and/or cytology positive for high-grade dysplasia or adenocarcinoma. Patients with follow-up (FU) <12 months were excluded unless they died within that time period. Definitive diagnosis of IPMN was based on histological or cytological diagnosis after fine-needle aspiration (FNA) or fine-needle biopsy during EUS or endoscopic retrograde cholangiopancreatography (ERCP). Highly probable diagnosis of IPMN was based on the findings on any one of these imaging modalities: contrast-enhanced, multidetector CT (MDCT), MRI with magnetic resonance cholangiopancreatography (MRCP), ERCP and EUS. The imaging criteria used to diagnoses IPMN were (1) presence of one or more dilated branch duct(s) (size ≥10 mm) communicating with a non-dilated (<5 mm) MPD (BD IPMN); (2) presence of a dilated MPD (≥5 mm) with no dilatation of its secondary ducts (MD IPMN); and (3) presence of a dilated MPD (≥5 mm) communicating with one or more dilated branch duct/s (mixed IPMN). Demographic and clinical data, diagnostic workup, indications for surgical resection and reasons for non-operative management were analysed with a special focus on associated comorbidities. Adult Comorbidities Evaluation (ACE) 27 was completed for each patient. ACE 27 includes comorbid conditions of various organ systems such as cardiovascular, respiratory, GI, renal, endocrine, neurological, psychiatric, rheumatological and immunological systems, as well as malignancy, substance abuse and body weight. Each category has three grades (1, mild; 2, moderate; and 3, severe), with the overall comorbidity score defined according to the highest ranked single ailment. Two or more grade 2 ailments occurring in different organ systems result in a grade 3 assignment. ACE 27 grades were listed as 0, 1, 2 or 3.16 Surgical procedures, pathology and postoperative course data were retrieved for patients who eventually underwent surgery. Data on disease progression (DP) and patient FU outcomes were obtained from the medical records or through telephone interview. DP was defined as the appearance of new lesions, any increase in size of BD component or MPD-dilation, development of solid components, new symptoms, development of metastases or vascular infiltration due to IPMN. Results are expressed as median (range). Subgroup comparisons on categorical data were done with χ2 and Fisher's exact test, while continuous variables were analysed by using Student's t test and analysis of variance method. Length of FU was measured from initial diagnosis of IPMN with high-risk stigmata or worrisome features to (1) last FU available for alive patients, (2) date of death for dead patients and (3) date of surgery for patients undergoing resection during FU. For statistical analysis, MD and mixed IPMNs were grouped together. Both overall survival (OS) and disease-specific survival (DSS) were evaluated. DSS was defined as the time between diagnosis and death due to IPMN progression. OS and DSS were calculated with the Kaplan–Meier method, and the results were compared using the log-rank test. Univariate and multivariate analysis was performed. Cox proportional hazard model evaluated significant predictors of OS and DSS. To evaluate the prognostic role of age at diagnosis, cyst size and MPD size, we identified three cut-offs by dividing the entire study population around the 25th, 50th and 75th percentiles. The cohort was dichotomised around each different cut-off. Log-rank comparison was then performed on each pair of survival curves to determine the most significant survival difference based on maximisation of the log rank χ2 statistic. A p-value <0.05 was considered statistically significant. Statistical analysis was carried out with SPSS V.16.0 (SPSS, Chicago, Illinois, USA). In this study, detailed analysis of timing/modality of IPMN progression and of predictors of progression was not performed. Between May 1993 and June 2013, the 281 patients (58% males, median age 70 years, range 33–89) who received a definitive or highly probable diagnosis of IPMN with worrisome features or high-risk stigmata were analysed for this study. Of the 281, 159 (57%) were BD-IPMNs and 122 (43%) had MD/mixed IPMNs (99 mixed IPMNs and 23 IPMNs involving exclusively the MPD). Of the 281 patients included in the study, 108 were collected from Verona, 74 Boston (48 Massachusetts General Hospital, 26 Brigham and Women's Hospital), 44 Ancona, 38 Paris and 17 Rochester. Preoperative diagnostic workup included MRI/MRCP (n=249, 88.5%), MDCT (n=173, 61.5%), EUS (n=145, 51.5%) and ERCP (n=20, 7%). Overall, FNA was performed in 98 patients (35%) and cytology was negative in 44 patients (15.5%) while it showed mucinous cells in 40 (14%), atypical cells in 11 (4%) and high-grade dysplasia/carcinoma in 5 (2%). Table 1 shows demographics and clinico-radiological characteristics of the patients, detailed reasons for non-operative management, as well as the presence of worrisome features/high-risk stigmata. Overall, 85 patients (30%) had a history of previous malignancy and 15% of these (n=13) had active disease at the time of IPMN diagnosis. Compared with patients with BD-IPMNs, those with MD/mixed IPMNs were older and had significantly higher ACE 27 scores. The presence of comorbidities was the main indication for non-operative management in MD/mixed IPMNs group, whereas most BD-IPMNs did not undergo surgery based on physicians’ recommendations. Ninety-one patients underwent surveillance based on physicians’ recommendations, and in keeping with ICG-II most of them (88/91, 96.5%) had worrisome features; the remaining three patients in this subgroup had high-risk stigmata, but they did not undergo surgery because of the presence of a synchronous extrapancreatic malignancy at the time of diagnosis. In the entire cohort, 213 patients (76%) were asymptomatic, with higher rates among BD-IPMNs patients (83% vs 68% in MD/mixed IPMNs, p=0.001). Most patients had only worrisome features (82%) at diagnosis, and the rate of high-risk stigmata was significantly higher in MD/mixed IPMNs group (31% vs 7.5%, p=0.0001). Median FU was 51 months (mean 60, range 6–240) with no significant differences between BD and MD/mixed IPMNs (median FU of 52 and 48 months, respectively). IPMN progression was observed in half of the cohort (147 patients, 52%) after a median of 32 months from the initial diagnosis (range 3–168 months). Of these 147 patients, 79 had BD-IPMNs (54%) and 68 (46%) MD/mixed IPMNs, 116 had at presentation only worrisome features (79%), whereas 31 had high-risk stigmata (21%). IPMN progression included increase in cyst size in BD or mixed IPMN (n=99), MPD dilation (n=40), new nodules (n=39) or new or recurrent symptoms (n=5) with some patients showing more than one progression feature. Thirty-eight patients (13.5%) underwent surgery during FU after a median of 50.5 months (range 7–240) from initial diagnosis. At initial diagnosis, there were 30 patients with worrisome features and 8 with high-risk stigmata. At the time of surgery, 18 patients had high-risk stigmata. Surgical resection was carried out in 36 patients (12.5%) while the remaining 2 had an advanced, unresectable IPMN-associated adenocarcinoma. Supplementary table S1 shows indications for surgery, surgical procedures, postoperative course and pathology data of the 36 resected patients. Increase in cyst size, development of solid components and increase in MPD dilation were the most common indications for resection. Pathological diagnosis of IPMN was confirmed in all resected patients. Overall, 7/36 (19.5%) patients had invasive carcinomas and 3 (8.5%) had high-grade dysplasia. Postoperative mortality was 8% in the group that underwent surgery, and all these patients had non-invasive IPMNs at final pathology. Of the 36 resected patients, 3 developed recurrent disease in the liver, 12, 24 and 25 months after resection. In the entire cohort of 281 patients, 34 (12%) developed an invasive pancreatic tumour, including 31 invasive IPMNs (11%) and 3 IPMN-distinct PDAC (1%). During FU, 57 patients (20%) died, and death directly attributed to the IPMN was observed in 25 (9%) whose characteristics are listed in online supplementary table S2. Figure 1 shows a flow chart with median FU of the entire cohort and different subgroups of patients with overall and IPMN-related death in each subgroup. Five-year OS and DSS for the entire cohort were 81% (figure 2A) and 89.9% (figure 2B), respectively. The results of maximisation of the log-rank χ2 statistic identified 70 years, 50 and 15 mm as the optimal age, cyst size and MPD size cut-off for survival benefit in the entire cohort, respectively. Table 2 shows univariate and multivariate analysis for OS. Independent predictors of worse OS were age >70 (HR 5.755), ACE 27 score >3 (HR 2.081), atypical cytology (HR 3.466), malignant cytology (HR 7.893) and jaundice (HR 9.405). Independent predictors of worse DSS (table 3) were age >70 (HR 10.279), atypical cytology (HR 11.576), malignant cytology (HR 21.502), jaundice (HR 28.429) and MPD >15 mm (HR 9.640). IPMN type, the presence of nodules/vascularised nodules, the presence of overall worrisome features/high-risk stigmata were not identified as independent predictors of OS and DSS. Cyst size > 30 mm did not affect DSS while cyst size >50 mm was associated with worse DSS at univariate analysis but it was not an independent predictor of DSS. Surgery during FU did not affect OS and DSS by univariate or multivariate analysis, and therefore, this subgroup of patients was included in all the analyses. 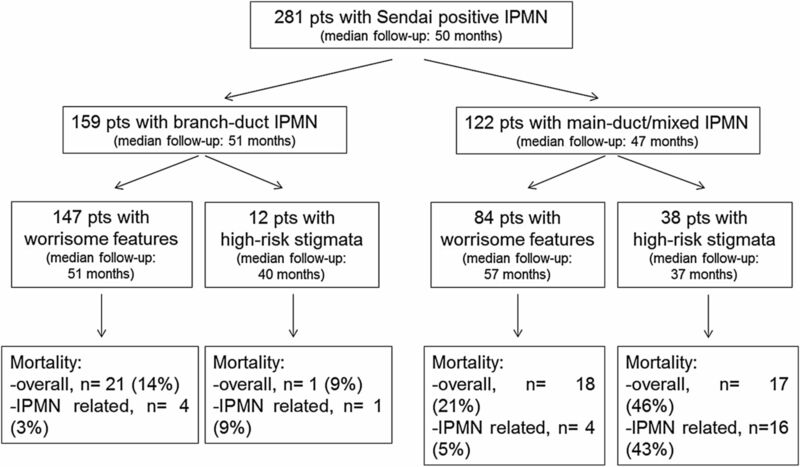 Flow chart showing long-term survival of 281 patients with Sendai-positive intraductal papillary mucinous neoplasms (IPMNs) stratified by IPMN type and by the presence of worrisome features or high-risk stigmata. Mortality percentages are referred to the overall number of 281 patients. (A) 5-year overall survival (OS) for the entire cohort was 81%. Median OS was not reached. 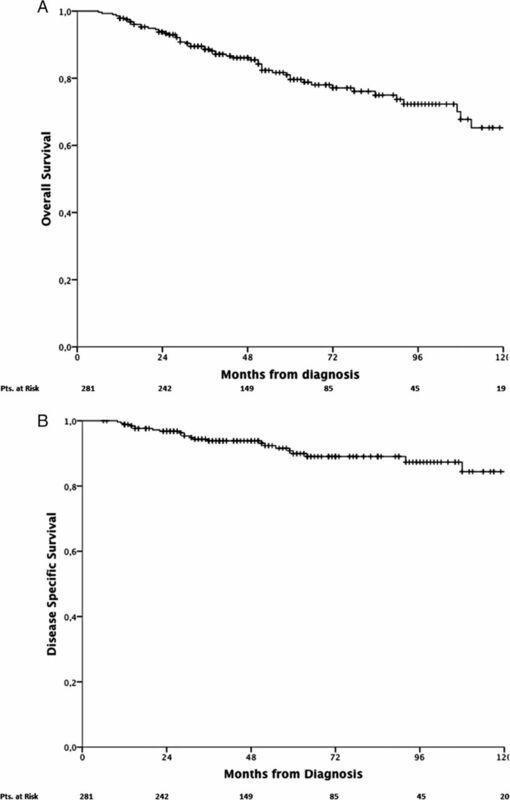 (B) 5-year disease-specific survival (DSS) survival for the entire cohort was 89.9%. Median DSS was not reached. Compared with MD/mixed IPMNs, BD-IPMNs had a significantly better OS (5-year OS: 86.4% vs 74.1%, p=0.002; see online supplementary figure S1) and DSS (5-year DSS: 97% vs 81.2%, p<0.0001; online supplementary figure S2). Since multivariate analysis identified similar predictors of OS and of DSS in the entire cohort of 281 patients, and considering the small number of IPMN-related deaths, only OS analysis was carried out for the two subgroups of BD-IPMNs and MD/mixed IPMNs. The independent predictors of worse survival in patients with BD-IPMNs identified at multivariate analysis (see online supplementary table S3) were male gender (HR 4.117) and age >70 years (HR 8.476). BD size at diagnosis or increase of BD size during FU did not affect survival. For MD/mixed IPMNs subgroup (see online Supplementary table 4), independent predictors of worse OS included age >70 years (HR 5.482), ACE 27 score >3 (HR 3.533), atypical cytology (HR 8.368), malignant cytology (HR 6.333) and jaundice (HR 5.019). In order to evaluate the impact of worrisome features/high-risk stigmata on IPMN-related mortality, only DSS was considered for their survival analysis. Patients with worrisome features had a significantly better DSS compared with those with high-risk stigmata (5-year DSS: 96.2% vs 60.2%, p<0.0001; figure 3). Table 4 shows the univariate and multivariate analysis for DSS in patients with worrisome features. Only age >70 years (HR 3.122) and ACE 27 score >3 (HR 8.103) were independent predictors of DSS. There were no survival differences between patients with BD-IPMN and MD/mixed IPMNs (5-year DSS 97.6% vs 93.8%, p=0.372). Independent predictors of poor DSS in high-risk stigmata group (table 5) were age >70 years (HR 15.766), malignant cytology (HR 10.881), jaundice (HR 18.004) and MPD >15 mm (HR 13.982). Although not statistically significant, survival of BD-IPMNs was higher than that of MD/mixed IPMNs in this subgroup (5-year DSS 91.7% vs 54.2%, p=0.096). 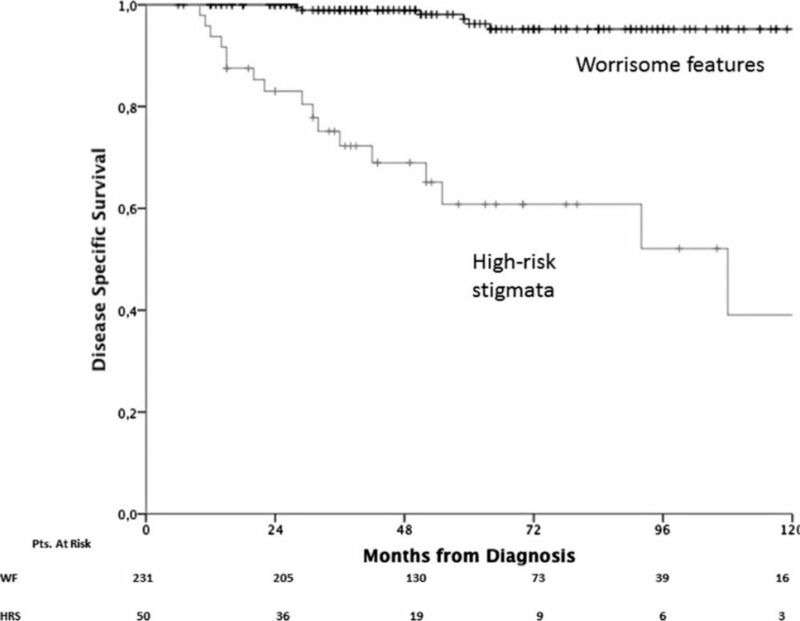 Patients with worrisome features had a significantly better 5-year disease-specific survival (DSS) compared with those with high-risk stigmata (5-year DSS: 96.2% vs 60.2%, p<0.0001). The management of IPMNs represents an area of intense investigation. Although several studies have shown that the transformation of BD-IPMN lacking malignancy-related features into invasive carcinoma is uncommon,9 ,13 ,17 ,18 an increased incidence of malignancy in BD-IPMNs has been recently reported.19–23 As a consequence, a management towards more aggressive treatment including prophylactic surgery for low-risk BD-IPMNs has been proposed. On the other hand, primary FU instead of pancreatic resection has been advocated for selected patients with MD/mixed IPMNs, suggesting that progression to carcinoma is not unavoidable in this subgroup.12 ,15 These recent and contrasting data point out that the natural history of IPMNs is largely unknown. Patients included in this study are of particular interest as they are theoretically at higher risk of harbouring or developing a malignant tumour. Of note, in our experience, most of these patients had a presumptive diagnosis of IPMN since EUS with FNA was carried out in only 35% of patients. Given that errors in diagnosis are common in the preoperative diagnosis of pancreatic cystic tumours,22–26 particularly when considering BD-IPMNs that represent 57% of our study population, this is a possible limitation of the study. However, the criteria applied for the definition and characterisation of IPMN are well accepted, and in all resected patients the diagnosis of IPMN was confirmed at pathology. Although IPMN progression was observed in about 50% of patients, only 12% developed an invasive pancreatic tumour including both invasive IPMNs (11%) and IPMN-distinct PDAC (1%). Similar results were recently reported by Uehara et al15 and Roch et al,12 showing a progression rate to invasive carcinoma of 10% and 12.9% in 20 and 70 patients with MD/mixed IPMN who underwent surveillance. The rate of IPMN-distinct PDAC in this cohort is lower than that reported by Japanese authors (4–9%),22 ,23 but it is in keeping with a 5-year pancreatic malignancy incidence of 1.4% reported in an observational study of 569 patients with BD-IPMNs who were managed nonoperatively.27 In our study, 57 patients (20%) died, but IPMN-related mortality was only 9%. These data resulted in 5-year OS and DSS rates of 81% and 89.9%, respectively. Of note, 36 patients underwent pancreatic resection after a median of 50.5 months from initial diagnosis. Half of these patients had high-risk stigmata, and at pathology 28% had invasive carcinomas or high-grade dysplasia. We recognise that surgical resection could have improved survival rates in the entire cohort by treating patients with malignant IPMNs. On the other hand, surgery-related mortality was 8%, which is higher than expected considering that patients were operated in high-volume centres, but may reflect some of the frailty of these patients. Clearly, surgery may have prevented some deaths due to IPMN progression, but it also contributed to mortality in other patients because of postoperative complications. In the entire cohort, independent predictors of poor OS were age >70 years, ACE 27 score >3, atypical/malignant cytology and jaundice, while poor DSS was associated with age >70 years, atypical/malignant cytology, jaundice and MPD >15 mm. These results demonstrate that overall mortality in this population is mainly related to age and associated comorbidities unless an IPMN is malignant at the time of diagnosis as evidenced by the presence of atypical/malignant cytology, jaundice or markedly dilated MPD. These observations also apply to BD-IPMNs and MD/mixed IPMNs subgroups. As expected, both 5-year OS (86.4% vs 74.1%) and DSS (97% vs 81.2%) were much higher for BD-IPMNs than MD/mixed IPMN. The observed survival rates, in the entire cohort and in IPMNs subgroups, are not much lower than those reported in surgical series including resected IPMNs. In particular, it is impressive that DSS for MD/combined IPMNs in our study is almost the same of that reported by Marchegiani et al describing the outcomes of 223 patients undergoing resection for IPMNs involving the MPD (81.2% vs 83%).7 At multivariate analysis, OS in MD/mixed IPMN was again affected by age, comorbidities and presence of atypical/malignancy cytology and jaundice, while age >70 years was the strongest independent predictors of poor OS for BD-IPMNs. Cyst size in BD-IPMNs is a debated topic when considering surgical indications. ICG-II identified cyst size >30 mm as a worrisome feature,6 and different studies including a systematic review/meta-analysis identified cyst size >30 mm as a parameter significantly associated with IPMN progression and/or the presence of carcinoma.8 ,28–30 On the contrary, other studies indicated that up to 25% of BD-IPMNs <3 cm harbour high-grade dysplasia or invasive carcinoma, and recommended a liberal resection policy regardless of cyst size at the time of diagnosis.19 ,20 In this setting, while ICG-II suggest very strict surveillance or surgery for BD-IPMNs >30 mm depending on patients’ age and comorbidities, European guidelines are more conservative and recommend surgery only for BD-IPMNs >40 mm unless other risk factors (ie, nodules) are present.6 ,31 Interestingly, when we looked at cyst size in BD-IPMNs, we found no correlation among cyst size >30 or >50 mm, increase of BD size during FU and survival both at univariate and multivariate analysis. This is an important observation since this group of 159 BD-IPMNs had a very indolent course, and OS and DSS rates demonstrate that these patients died mainly of IPMN-unrelated causes, suggesting that pancreatic resection would be an overtreatment for most of them. A major observation from this study is that the risk of IPMN-related death was 10-fold greater for patients with high-risk stigmata compared with that of patients with worrisome features (5-year DSS: 60.2% vs 96.2%). The more indolent course of patients with worrisome features applies to all IPMN types, including MD/mixed IPMN. In fact, in this study MPD of 5–9 mm did not affect DSS. These data are in keeping with the results of a recent meta-analysis showing that MPD of 5–9 mm without other indications of malignancy may be better managed by careful observation rather than surgery.8 On the other hand, high-risk stigmata, including jaundice, malignant cytology and dilated MPD, were strongly associated with malignancy and decreased survival. We failed to identify enhancing nodules, a well-known feature associated with invasive carcinoma in IPMNs,6 ,9–10 ,28 ,32 as an independent predictor of survival in all the analysis carried out in the study. This observation, however, should be considered with caution because the study is retrospective, and overall nodules and enhancing nodules were identified in only 48 (17%) and 22 patients (8%), respectively, and it is possible that the presence of nodules at diagnosis had prompted clinicians to operate patients without any delay. In aggregate, these data confirm that high-risk stigmata represent an indication for surgery, whereas primary surveillance of patients with worrisome features appears to be safe, and non-operative management according to ICG-II guidelines rather than surgical resection can be considered in such cases, particularly in those with major comorbidities and/or advanced age. Since median FU was <5 years in this study, a definitive conclusion regarding the real risk of progression in patients with worrisome features cannot be drawn, and only longer FU data will answer this question. Moreover, this cohort represents a selected group of patients because most of them, especially those with high-risk stigmata, did not undergo surgery because of advanced age and comorbidities. Therefore, our conclusions may not be fully applicable to a younger patient population or to patients with a strong family history of pancreatic cancer. In conclusion, we report the largest experience with IPMNs with worrisome features or high-risk stigmata that underwent primary surveillance. Our data indicate that 80% of these patients are alive 5 years after initial diagnosis. The risk of IPMN-related death was 10-fold greater for patients with high-risk stigmata compared with those with worrisome features. While patients with high-risk stigmata should be considered for surgery, the clinical course of patients with worrisome features seems particularly indolent, at least in the first five years after initial diagnosis, and therefore, non-operative management with close follow-up may be appropriate.
. Intraductal mucin-hypersecreting neoplasm “mucinous ductal ectasia”: endoscopic recognition and management. Am J Gastroenterol 1996;91:2548–54.
. Intraductal mucin-hypersecreting neoplasms of the pancreas. A clinicopathologic study of eight patients. Gastroenterology 1991;101:512–19. Contributors CF-dC and MF contributed equally and share the senior authorship SC: responsible for the conception and design of the project, acquisition, analysis and interpretation of the data. Main author for drafting the manuscript. CB, RS, PL, PAB and STC: assisted in the interpretations of the results, drafting and critical review of the paper. GM, GM, VR, SLS and NA: assisted in the acquisition of data, interpretations of the results and critical review of the paper. SP: performed the statistical analysis and assisted in the interpretation of the results and in the critical review of the paper. MF, CF-dC: contributed to the conception and design of the study. Assisted in the interpretation of the results, drafting and critical review of the paper. Ethics approval This retrospective study was approved by Internal Review Board.